Let’s Talk Mental Health is a Wellness panel discussion focusing on addressing and improving Mental Health and Wellness in the Workplace. This 2-hour lunch workshop is ideal for staffing agencies, community leaders, elected officials, business owners, managers/supervisors, human resource staff, employees, and anyone encountering the challenges of addressing the mental health needs of the workforce. What is Mental-Emotional (ME) Health and Wellness? The impact Mental- Emotional Health and Wellness on productivity. Substance Use, Anxiety, Depression, Life Stresses, Interpersonal conflicts. Addressing and reducing the stigma of mental health and treatment. Information on creating a Mental-Emotional Wellness environments. Resources and action steps for improving Mental-Emotional health in your business. A brief introduction of Transactional Analysis, Mindfulness, and EMDR. Another great and successful iRun Harvest 5k! 2nd Annual iRun Harvest Homecoming 5K Registration is Open! 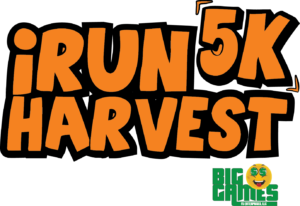 F5 Enterprises, LLC, dba Big-O-Games, Harvest Homecoming, Sorgs Sports & Wellness, Strandz & Threadz, along with other community partners and friends, are excited to announce the 2nd Annual iRun Harvest 5K (3.1 miles) series. Proceeds from the 5K will go to support Blessing in a Backpack, a nonprofit dedicated to fighting childhood hunger. Saturday, October 6, 2018 at Sorg’s Sport & Wellness, 800 E. 8th Street New Albany Indiana. The 2nd annual iRun Harvest 5K brings people of all abilities together to support the battle against childhood hunger. 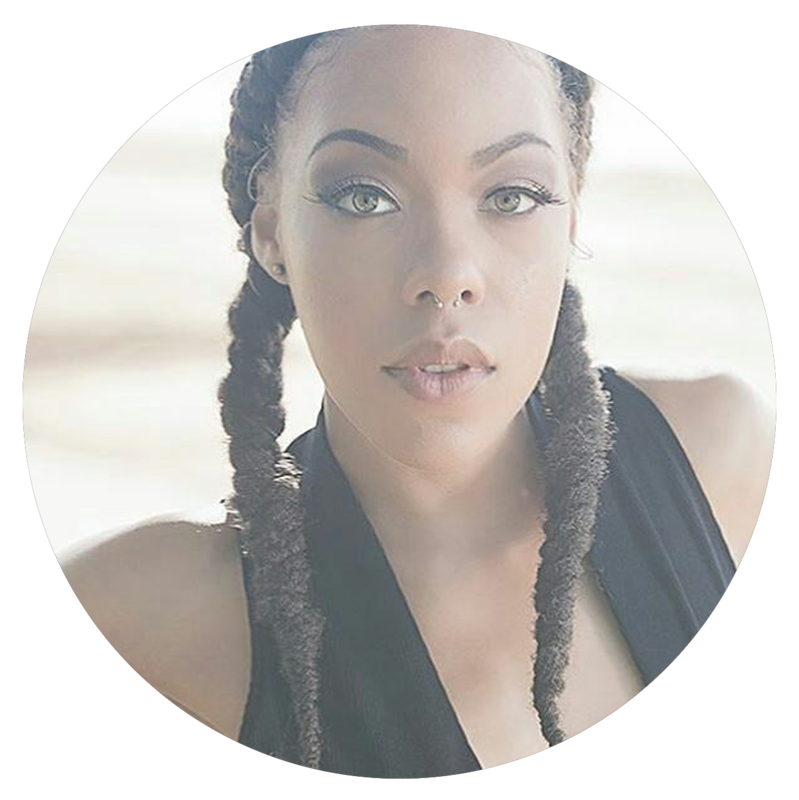 iRun Harvest is a family-friendly event featuring Midwest Award winning DJ Dommy Styles, Music Producer DJ VAN, and Local Radio Personality from B96.5 DJ Q. iRun Harvest will have Big-O-Games, food, and fun for all ages. This festive event will also feature booths with participating community businesses, and visits from our local leaders. Not a runner? No worries. iRun Harvest is for everyone! We encourage everyone to participate at their own pace. Run, jog, walk, or stroll your way to the finish line. Bring your family, build your own team, co-workers, etc. For advanced runners, iRun Harvest 5K (3.1 miles) will be officially timed by Photo Finish Timing. Participants who register in advance will have the opportunity to win fun swag and discounts to local businesses. You can register to participate as individual or create a team and participate as a team. Join the Harvest community in the commitment to get out, get healthy, and fight childhood hunger! Adult Runner: $30.00 for Adults, Youth Runner: $20.00 Children under the age of 14. • Timed Run with Awards for multiple categories. iRun Harvest was Super Fun, thanks to everyone who came out! Below is the link for the event images as well as the race results. Women’s Empowering Women Power Breakfast Series! JEFFERSONVILLE, INDIANA, September 8, 2017- F5 Enterprises, LLC announces The fourth annual Women’s Empowerment Breakfast Series. This year, W.E.W is a two-day series featuring a red carpet Cut-n-Sew Fashion Fusion event called, “Fall Fashion Experience” (FFE); and will take place Friday, November 17. Doors will open at 6pm and advanced tickets can be purchased at http://wewseries.eventbrite.com. The signature W.E.W Power Breakfast will be held on Saturday, November 18, doors will open at 8:00am and events will be held at 300 Spring Building, 300 Spring St. Jeffersonville, IN, 47130. 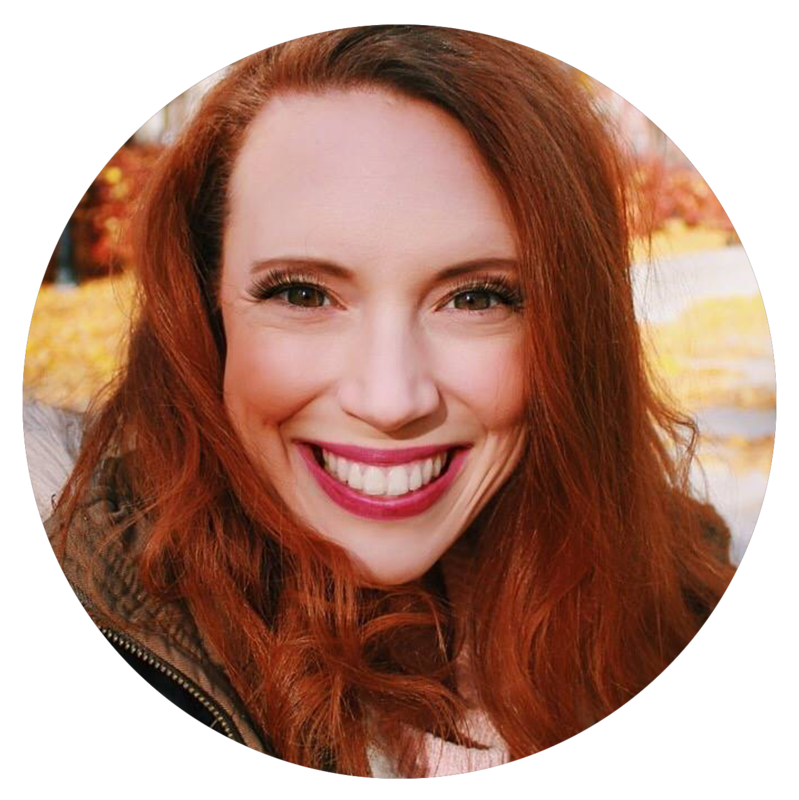 W.E.W Power Series will include a full breakfast, by caterer Sweet Rosemary Catering, and a thought provoking common conversation, led by four successful and uniquely incredible women. Attendees will hear from PhD. Angelique Johnson, CEO/founder MEMStim LLC, Angie Fenton, Editor in Chief of Extol Magazine and WHAS 11 TV Reporter, Nikki Jackson, Senior VP & Regional Executive of Federal Reserve Bank, and Licensed Clinical Therapist, and W.E.W host Teah Williams-Hampton, LCSW. The Women’s Empowerment Power Breakfast Series will evoke laughter, tears, and joy. Our participants will connect with a wide variety of women from diverse backgrounds. This event creates an opportunity for women to share, learn, and become inspired by our four outstanding panelists and each other. One woman alone is great and will change many lives, but many women together will change the world. Some of the key sponsors include Jeffersonville Urban Enterprises Association, Republic Bank, Ingrid Design, F5 Enterprises, LLC, Ann DeEvelyn Co., Louisville Be-Spoke, Underproduction Multi-Media, and other community friends. Breakfast online early bird tickets are $35, a table is $280 (Seats 8). Breakfast ticket at the door is $45. Fashion general admission ticket is $45,VIP ticket is $75. Weekend pass is $110. Portions of the proceeds from all W.E.W events support the W.E.W Women’s Scholarships. F5 Enterprises, LLC Women Empower Women College Scholarship program bases its award totally on essays written by the applicants. Consideration is not given to grades, academic program or financial need. The applicant must be enrolled in a degree program in an accredited U.S. institution of higher learning during the academic year following the application date. (or women of color) in today’s political and socioeconomic culture? 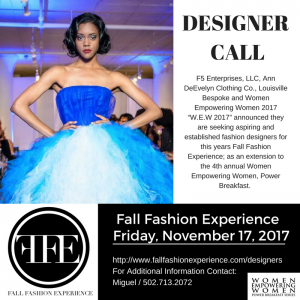 FFE Designer Call for November’s W.E.W & FFE 2017’s Showcase. 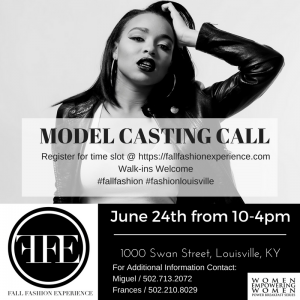 In partnership with Ann DeEvelyn Clothing Co and Louisville Bespoke, F5 Enterprises, LLC and Women Empowering Women 2017 “W.E.W 2017” have announced that they are seeking aspiring and established fashion designers for this year Fall Fashion Experience (FFE 2017). The event will be held Friday, November 17, 2017 as an extension to the 4th annual Women Empowering Women, Power Breakfast. “Our goal is to identify and promote local and regional aspiring designers. Therefore, we decided to open the designer call to all cut & sew designer genres.” Said Miguel Hampton founder of W.E.W and promoter FFE 2017. Designers of any genre are welcome to submit (including but not limited to: Ready-to-Wear, Couture, Swimwear, Menswear, Accessories). However, there is limit to how many designers will be selected this year. Designers can submit their work for consideration in two ways. Deadline for designer submissions is July 7, 2017 at 11:59PM. Designer submissions will be reviewed and judged by the FFE 2017 talent committee, which will choose up to 12 of the top submissions.. Selected designers will be notified via phone and email by July 14, 2017. For additional information regarding designer packages, fees, etc. please visit https://www.fallfashionexperience.com/designers. For questions please email FFE at fl@f5enterprises.com. Make It A Hot 2017!! 4 Trending Steps to Make It A Hot 2017!!!! “Go Brand Yourself” Start Branding yourself Today, b/c tomorrow might be to late! 1. “Build Your Brand” Identify your ideal customer, Go sale them exactly what they are looking for and then give them what they need! Most customers only show you their, right now; remember you are the expert and this is your opportunity to learn their big vision, and show them results! 2. Learn; Think, Talk, Text, Social Media like a Millennial! Don’t get stuck thinking like the old person in the room, landlines are outdated, mail is slow and your business model just might need to change. Millennials are here with one a bold opinion, and they are one of the most educated generations in the country and they are not shy about telling you. 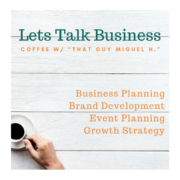 It’s time you treat your business/brand the same way! 3. Social Media is the Alpha & Omega – Where are you? Do you have a Social Media Plan and Strategy? 79% of all internet users are on Facebook, world wide there are 1.8 billion people logged into Facebook daily and there 1 billion active users on YouTube, 21% of all US adults use Twitter, 28% of all U.S. adults use instagram. Bottom line social media is where your customer is, time you build a plan and plan to win! 4. Get a head of the Trends– yes get of our chair and step out in the world b/c your competitor just did. 3 quick B2B Tends that are affecting your business even if you don’t know it. The Freelancer – By 2020 Intuit predicts 40% of the U.S. workforce will be freelancing in some capacity. More and more people are using their talents to create their own opportunities, you can continue to compete or you move your business into the Collaborative Age. Concierge Selling – All industries are changing and with the growth of ecommerce, in many cases your sales person just isn’t needed for the small stuff. 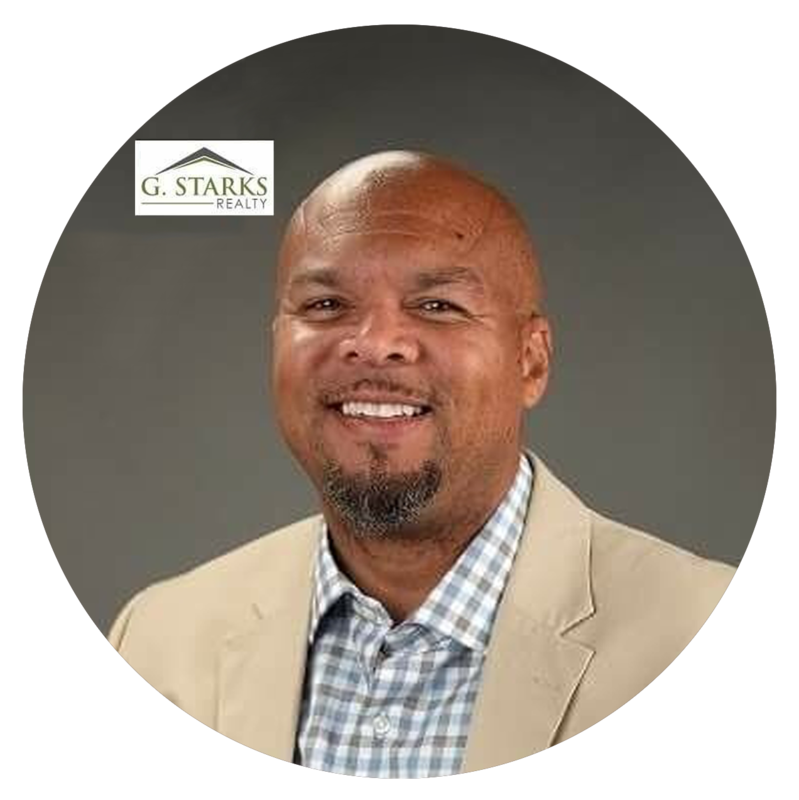 However, regardless of industry it is important for you Sale teams/person to be more ingrained in the customers overall needs and business planning because they are will be needed for the more complex business process. Concierge selling is the next level of client retention and development. Branding – two words “Private Label” if you don’t have your name, logo, or slogan on it, your not relevant! As long, as I have been in the promotional products business the one thing I have seen rise in the market is, less people want to wear Nike, Sekio, Fossil, Izod etc… they want to be Nike! Marketing and Advertising has changed, have you? Building your Private Label Brand is the new leader in promotional recognition, and advertising game. In 2017 you want to Be a Brand Leader! This what a few of my friends had to say about winning in 2017! Stay connected and learn more about 2017 Workshops, Events and Programs! Jeffersonville, IN. – Friday, November 18, 2016 – Women Empowering Women’s Breakfast is back! F5 Enterprises, LLC and Title sponsor JUEA, the Jeffersonville Urban Enterprises Association Present to you the 3rd Annual (W.E.W) Power Breakfast of the series. This uplifting event will take place Friday, November 18th from 7:30 am – 3:00 pm at the 300 Spring Building, at 300 Spring Street Jeffersonville, IN 47130. This year the W.E.W Series has been expanded to include networking and additional opportunities for small business owners to purchase business booths to showcase their products and services. The Power Breakfast will also recognize key local women whom have displayed leadership, mentorship and volunteerism throughout the community. Our program host is Licensed Clinical Social Worker, Teah Williams-Hampton LCSW, followed by our distinguished speaker panel will feature WLKY News Anchor/ Reporter, Anne Bowdan, Entrepreneur / Exit Realty One Real Estate Agent, Julie Gamble, Entrepreneur/ Ann DeEvelyn Clothing Co. Fashion Designer, Frances Lewis, and Entrepreneur/ Mary Kay Regional Manager, Silisia Evans Moses, and they will be joined by Special Guest, Young Professional & Author of “Things I Never Talk About”, Lanisha Porter. Accompanied by a full breakfast, catered by Paula Hunter, Chef at the Black Italian. This year’s program will rival previous years! Accompanied by powerful stories, great food, great networking and life lessons; we will honor some of the great women in our community. This years W.E.W program will leave women and men inspired, and ready to take on the world.” said Miguel Hampton, Promoter of the W.E.W Power Breakfast. Email Miguel or WEW INFO, phone: 502-713-2072.